Well, clearly my ‘standard’ schedule of posting on a Saturday is well and truly out of the window! I go back to Uni next Saturday, so after that I’ll probably go back to posting on Saturdays :). And the whole thing in all it’s glory. 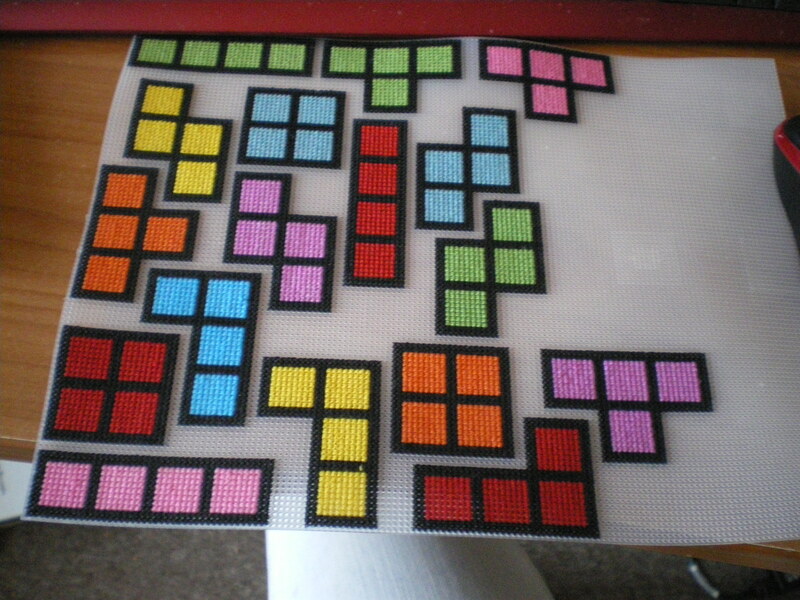 I’ve got plans to turn this into a hanging, so there’ll be another picture when that happens. 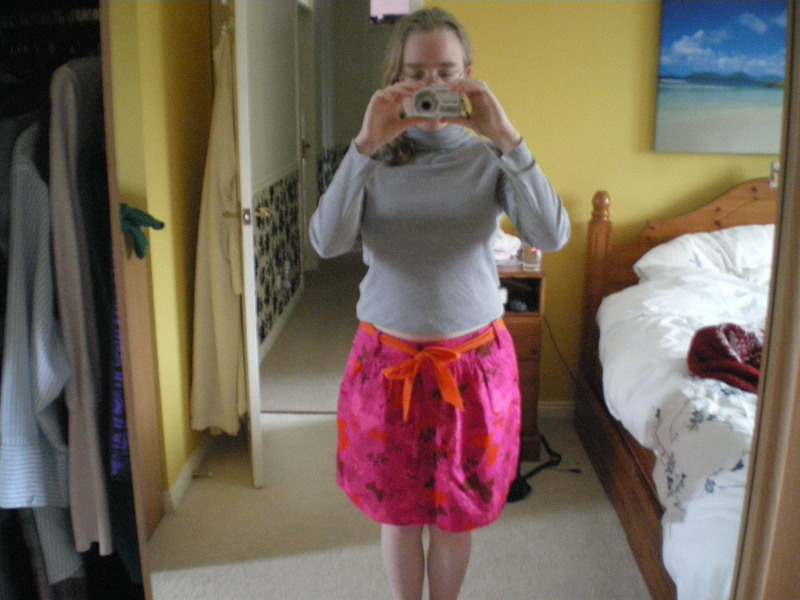 Then, in 2015 my mum very kindly introduced me to the basics of dress-making, and I’ve made a skirt. No progress pics of this, but here it is all finished. 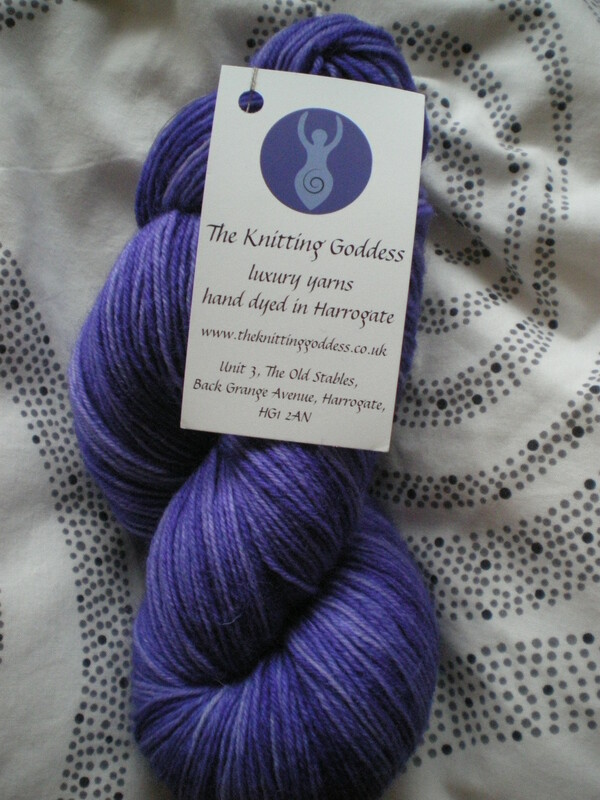 I’ve started making a pair of pyjamas as well, in some gorgeously soft fleecy material :). Stick pins in so they’re facing the edge of the material. 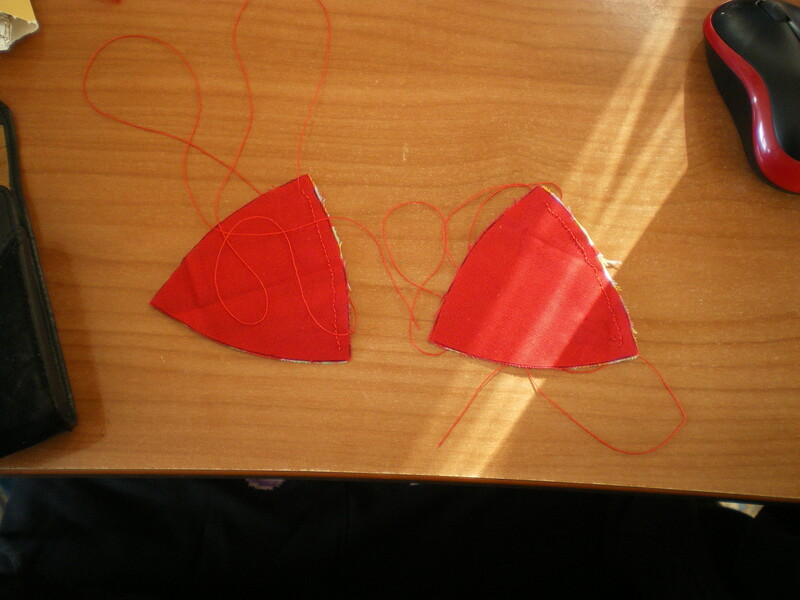 Then the head is out of the way for stitching and the foot will simply glide over the pins themselves. Very obvious when told! Measure yourself! Just because all your jeans are size 8, doesn’t mean that patterns follow the same sizing guide! Lesson learnt the hard way. Mums are somehow magic. 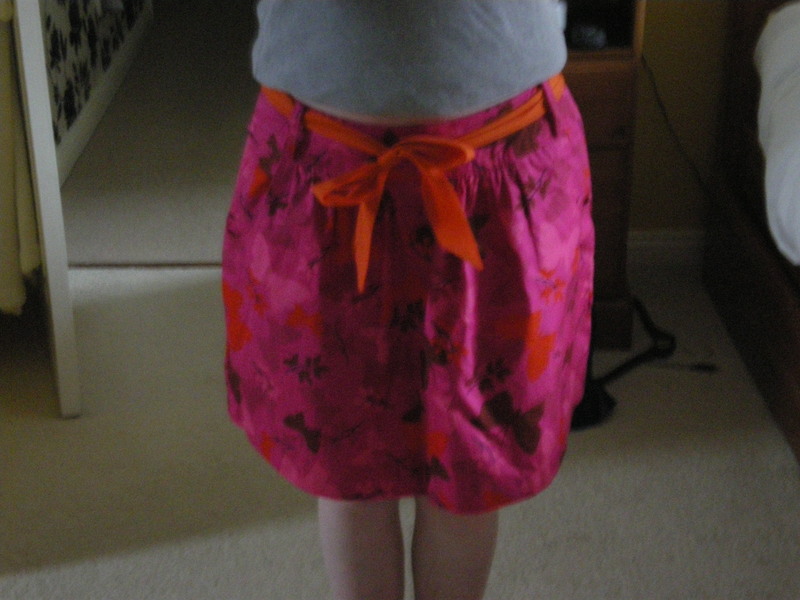 When mine ironed straight onto interfacing, it’s fine. If I try…oops! 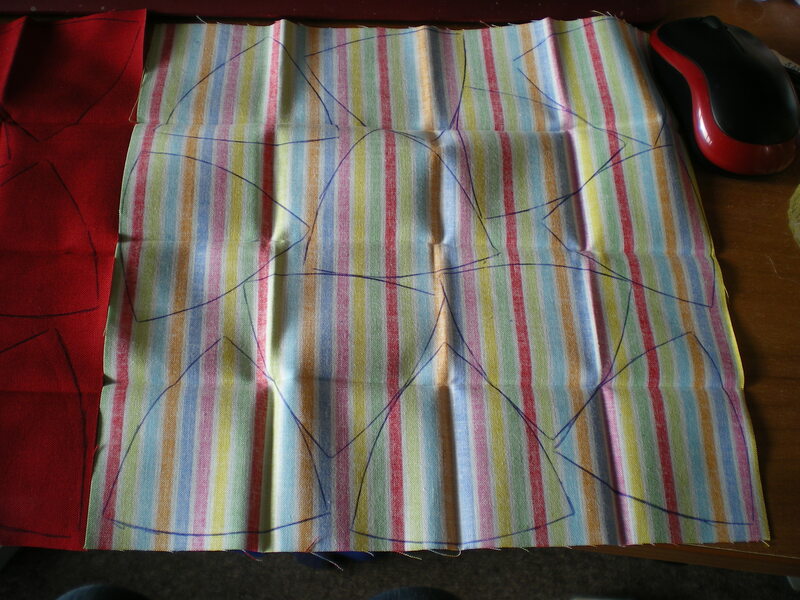 If you baste/sew for the gathers inside the seam allowance, you don’t need to remove them when sewing the whole thing together! Genius! Gathers don’t need to be perfect. Actually, nothing needs to be perfect. 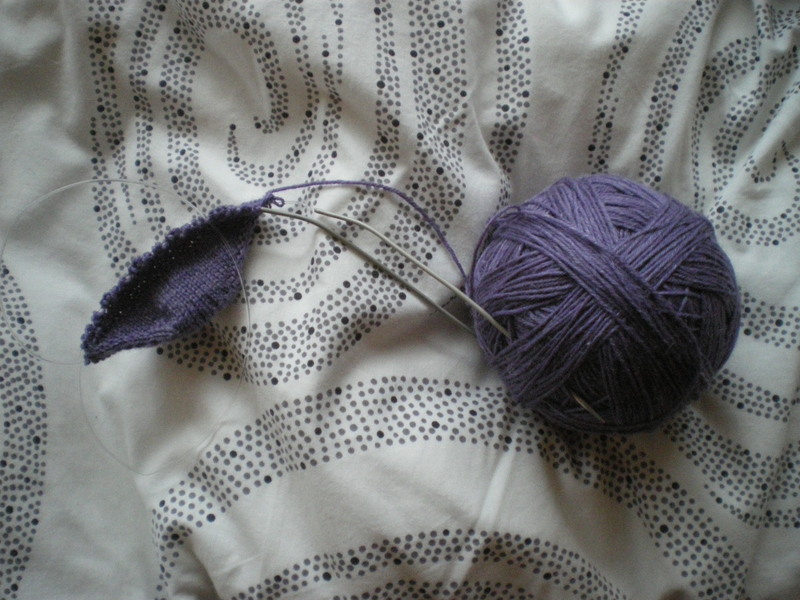 Seam allowances can hide a multitude of sins. It’s very easy to lose track of time when doing the whole machine-iron-table-machine thing. Pay attention and take breaks to sit down and have a drink. Otherwise you hurt afterwards! While dress-making is fun (and I would love to have quite a few items in my wardrobe) I’m not head-over-heels in love with it. Which is probably a good thing, seeing as how I only have a few weeks a year to use my mum’s, as I’m away in York so much! 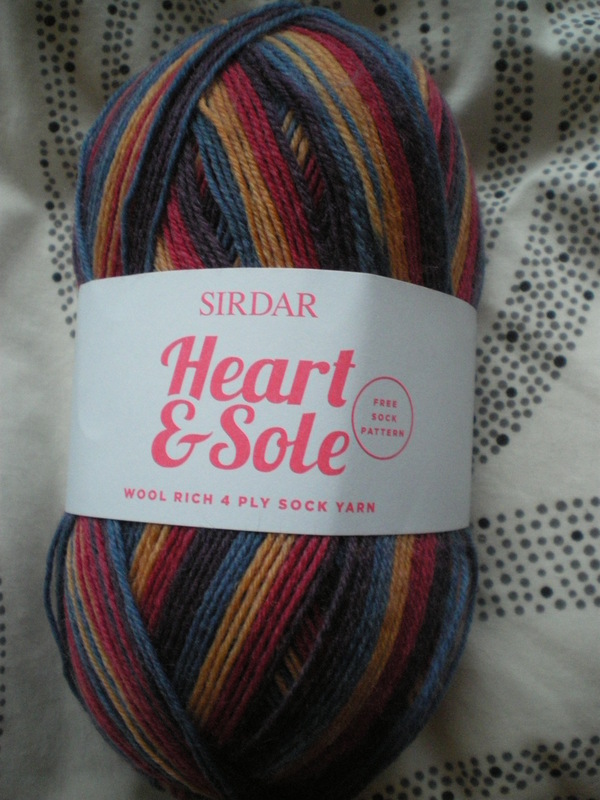 So, after the 12 hours I spent on a train on Monday and Tuesday, I thought that I had a pretty good handle on the sock situation (remember that I need to knit 2 pairs this month to make 12 pairs this year…), and then realised that I still have an entire pair of socks, and half of my current pair to knit. 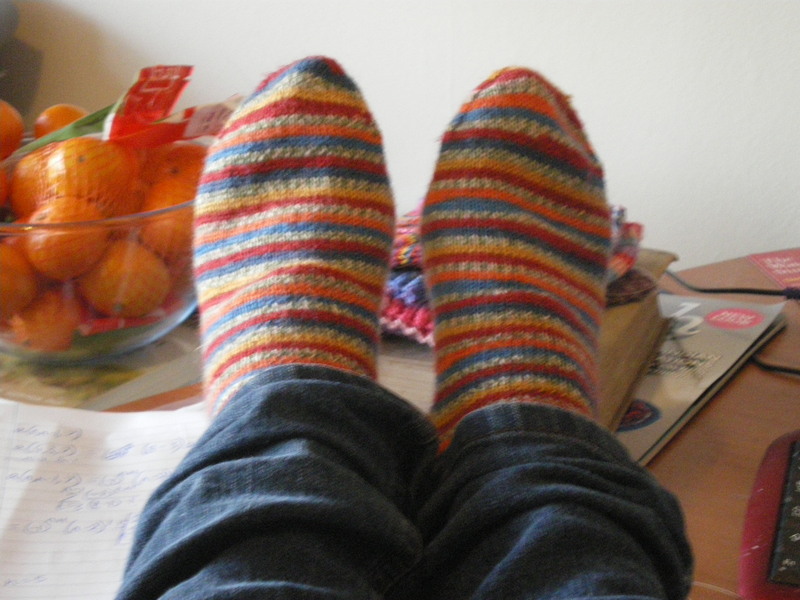 So, I guess that’s doable, after all there will probably be many hours sitting around watching tv over Christmas (and my last pair will probably be vanilla…no need to tempt fate, eh?). 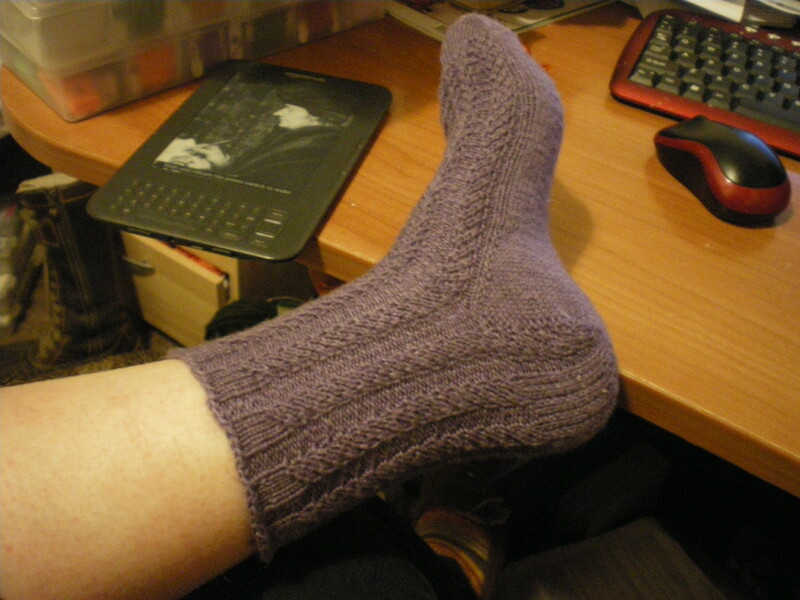 Anyway, here is my foot modelling the finished sock. 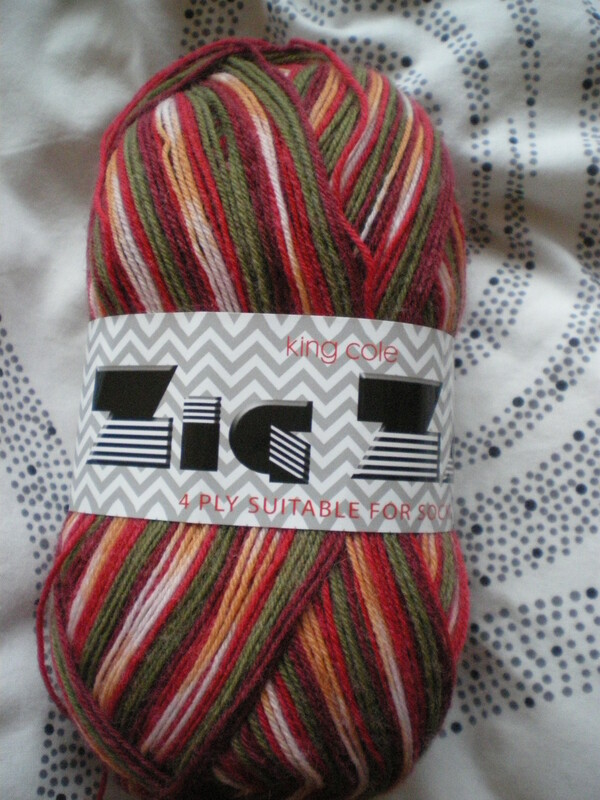 At the same time, I’d quite like to finish my OUAT sampler this year. 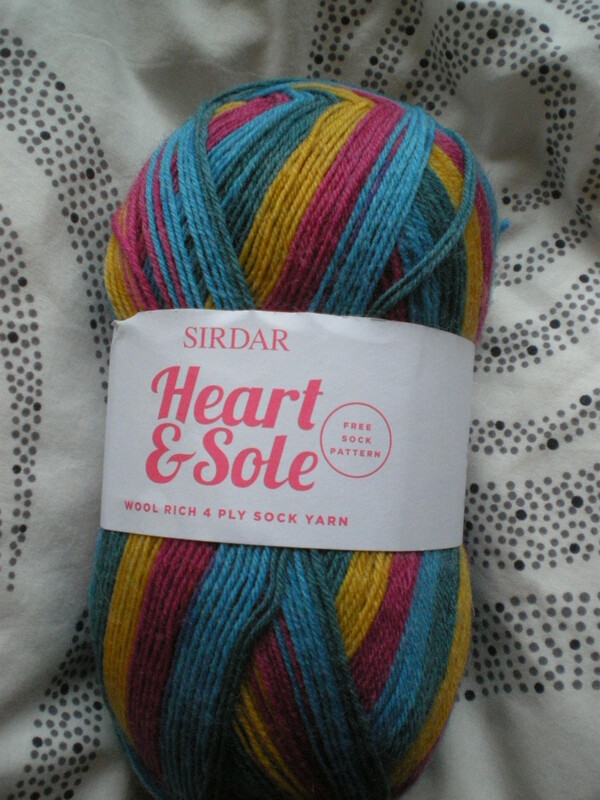 This is almost certainly not going to happen…I’m catching the train to Salisbury on Thursday morning, and I need to clean the house and pack before I go, so I’m not sure how long I’ll have to stitch on Wednesday. 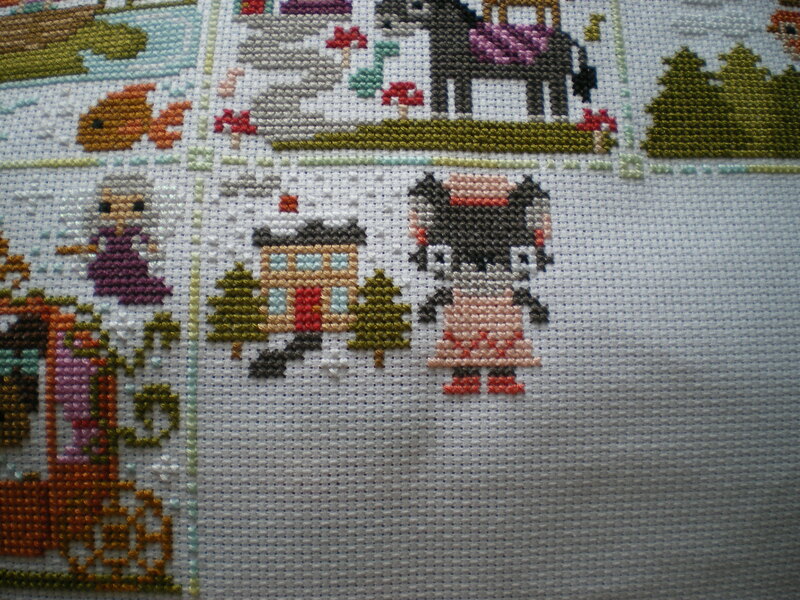 I have, however, finished November’s block (Little Red Riding Hood, if anyone has forgotten! 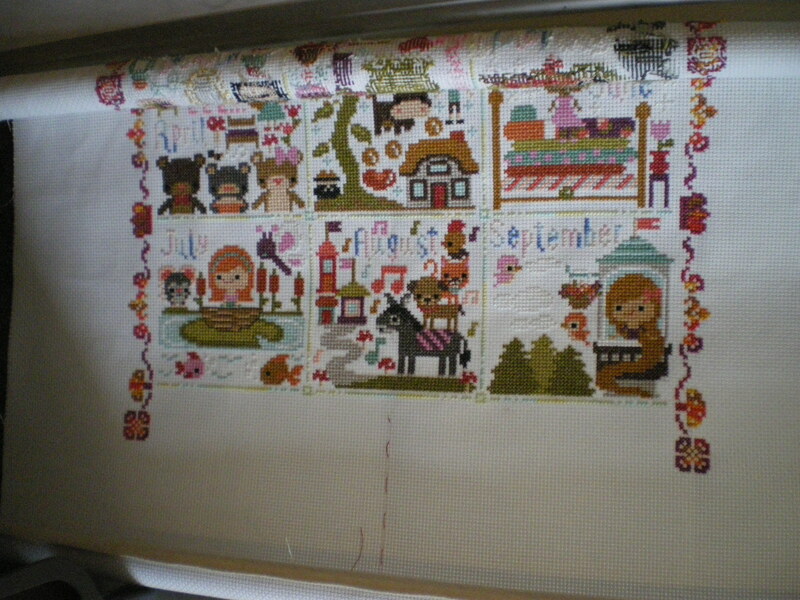 ), and all the border, so all that is left is December’s block. 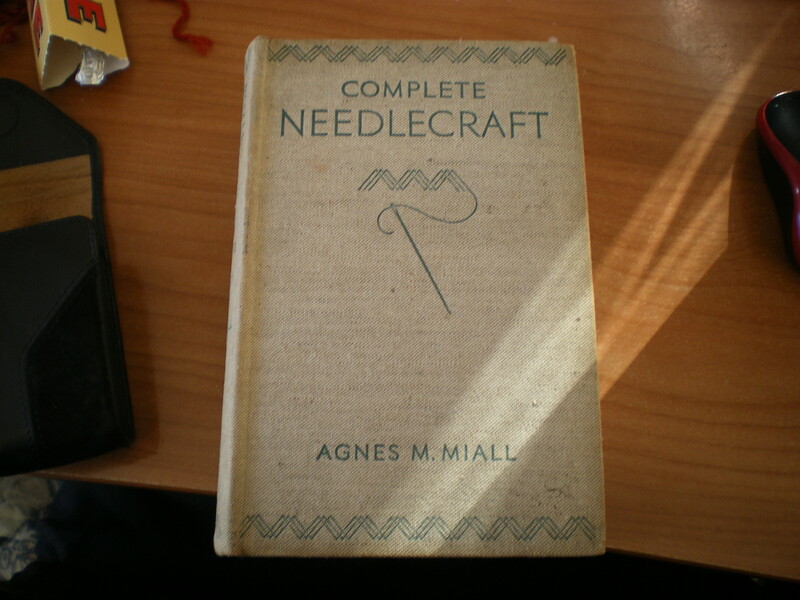 And the title and year, but they’re so small they don’t seem to count, somehow… I know, logically, that this is not going to be finished before I go home, which means it’s not going to be finished until next year. I just have to keep reminding myself that this is ok, that I don’t need to finish it before I go home. That this self-imposed deadline is not important, and getting a decent nights sleep before I go home is! Does anyone else ever get like this? Any ideas for reminding myself that it really isn’t important? … so how is everyone getting on with various challenges? 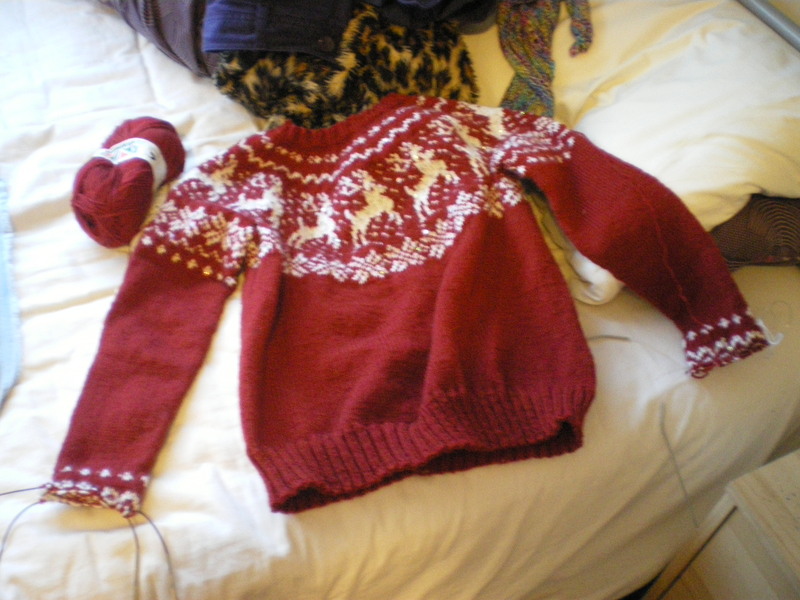 My sweater is nearly finished, so I’m sure that tomorrow it’ll be finished and ends sewn in and all that jazz! It’s finally getting to the point that I’m getting rather excited about the fact that I’ve actually knitted a sweater!!!! 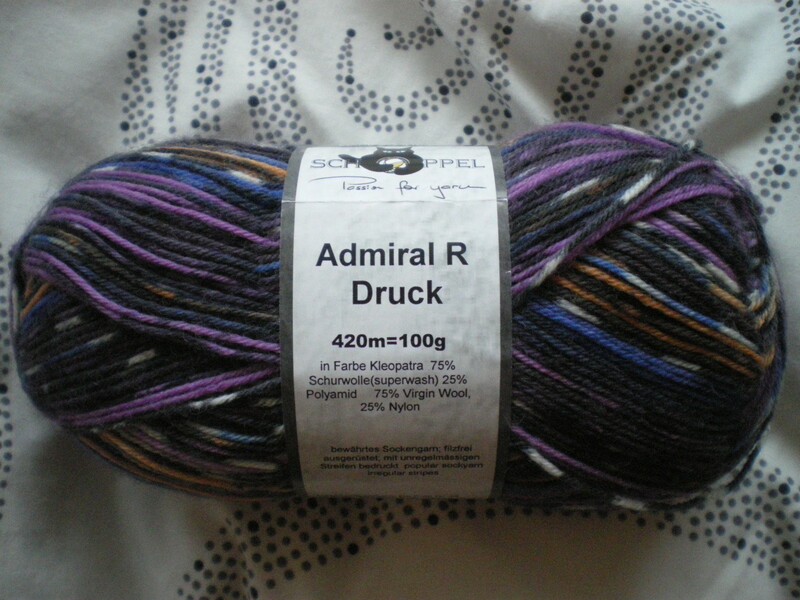 So, next week there will be stash photos, and a finished jumper, and clues for December’s cross stitch block (and you may get it on Friday evening, as I need to cook a massive dinner on Saturday)! Lucky you guys! 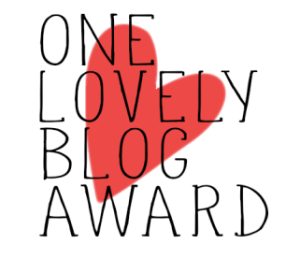 Makes up for these rather boring posts this month while I plug away at my sweater! And that reminds me- November’s block. Well done to everyone who guessed Little Red Riding Hood. I’m still rather confused about the snow, but there we go! because I’ve got a load of work to do, and I really want to get back to my sweater! But first of all, November’s block. 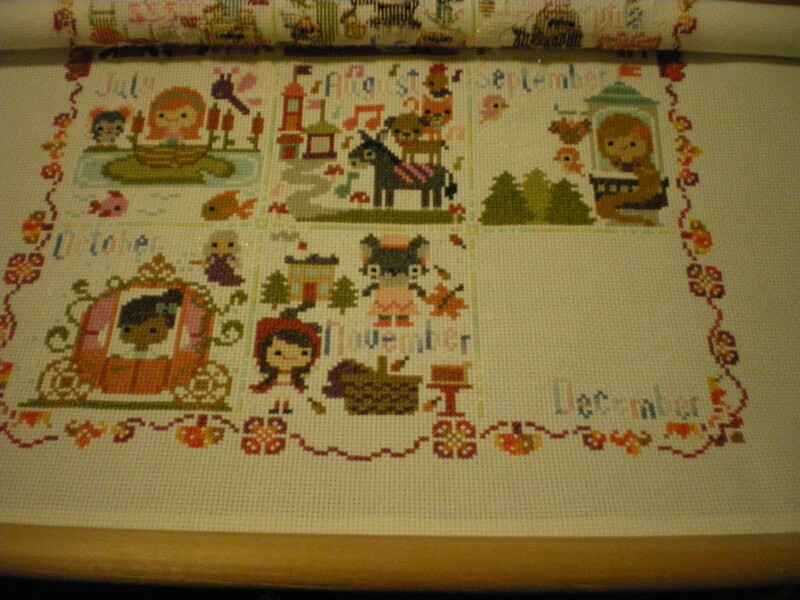 Clearly the hints given last week weren’t enough, so here’s a photo of what I did last weekend (before I decided that December was plenty big enough to do the rest of November’s block, as well as December’s and finishing the border. I’m not really quite sure why there’s snow. I mean, I know that it’s November’s block, and therefore Winter, and therefore snow makes sense, but the story is set in the Summer, because there are flowers. 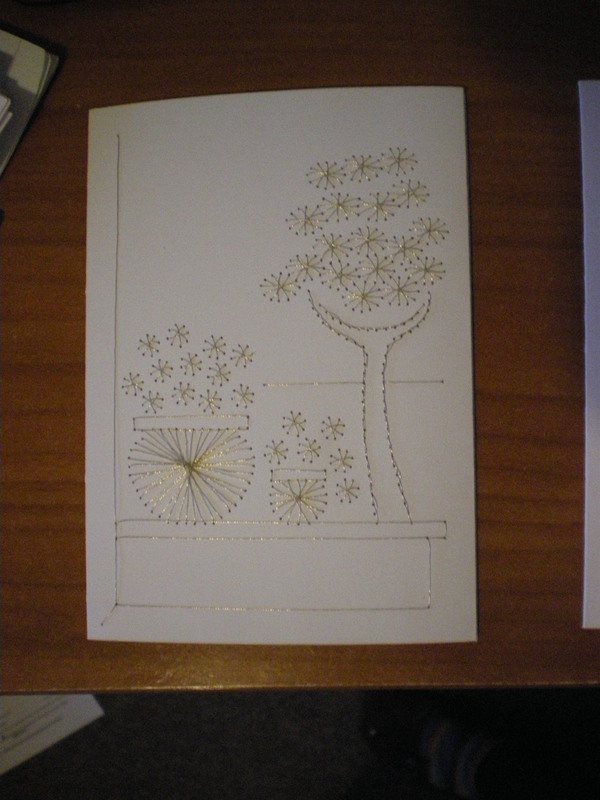 And in the Winter, I can’t see any family being happy with an elderly lady in ill health living by herself ages away! And yes, those are the clues for this week! Let’s see what you make of them, and next week I’ll give some more if people still aren’t getting it. Since this pic was taken, I’ve split for the sleeves and done half of the band of stars. I need to get my arse into gear if I want to finish this in November, but with so much stuff happening at Uni it’s difficult to find the time to really get into it! Hopefully I’ll be able to spend lots of time on it tomorrow! Right, that’s everything crafty from me I think. 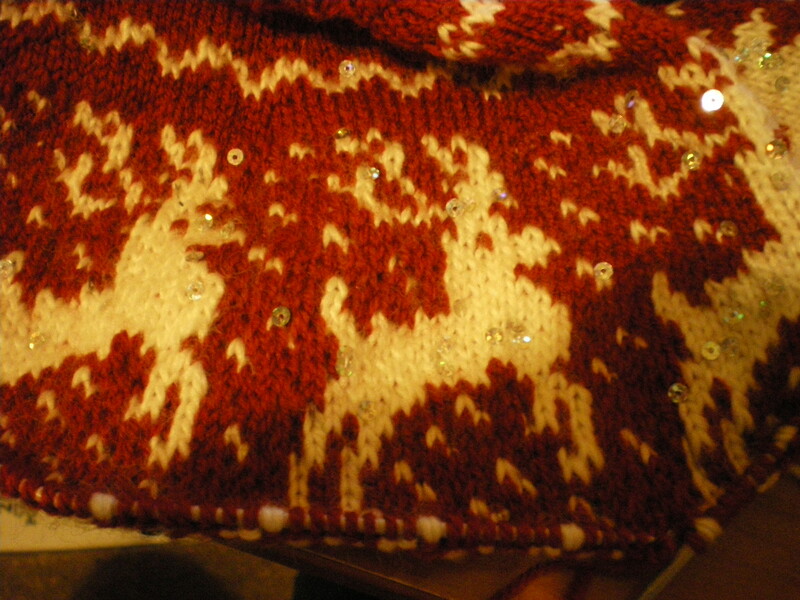 I’ll see you all next week when hopefully I’ve churned out lots more on my sweater! 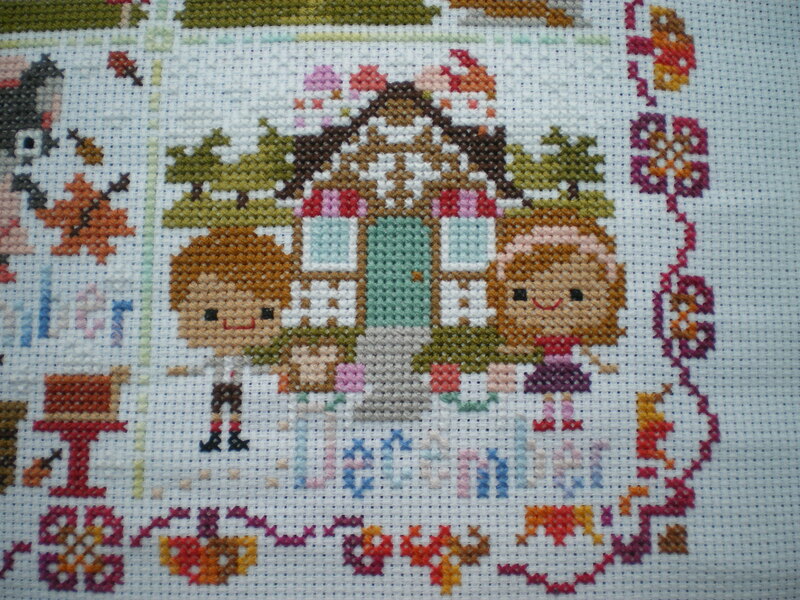 Woo hoo, I finished (decided I had enough) of cross stitching on plastic canvas for my mum’s Christmas present. 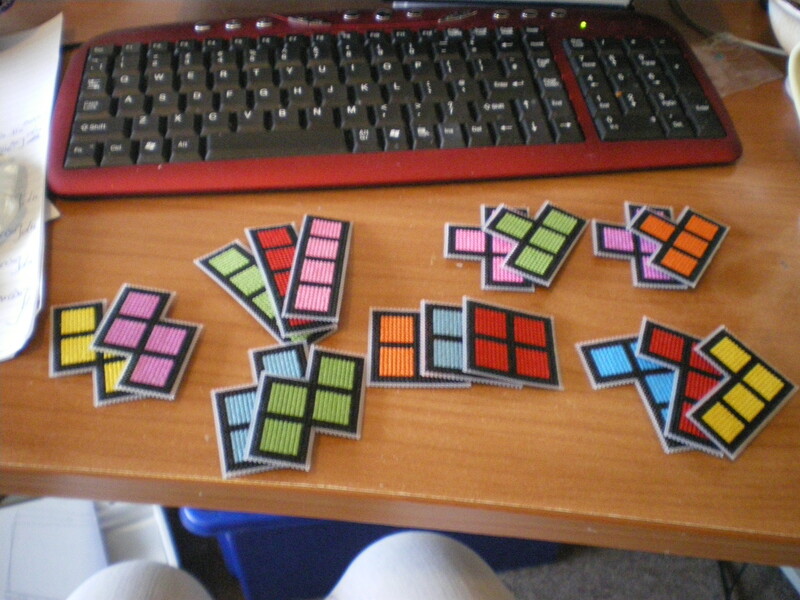 I am so glad that these things are finally done! 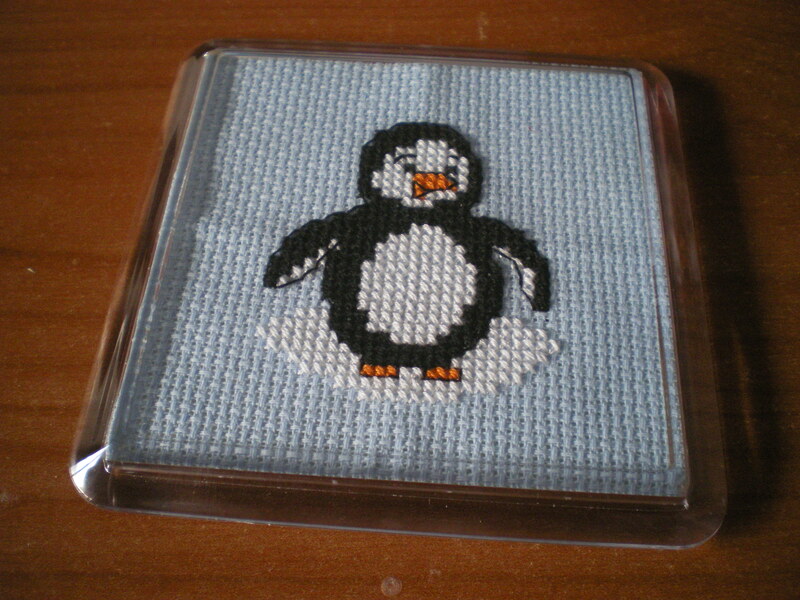 Although I haven’t finished with the plastic canvas, as I’ve signed up for my first ever exchange- a Christmas tree decoration cross stitched one 🙂 So that’ll have to be kept under wraps for now 🙂 But if you fancy signing up, it’s being hosted by hookedonstitches. 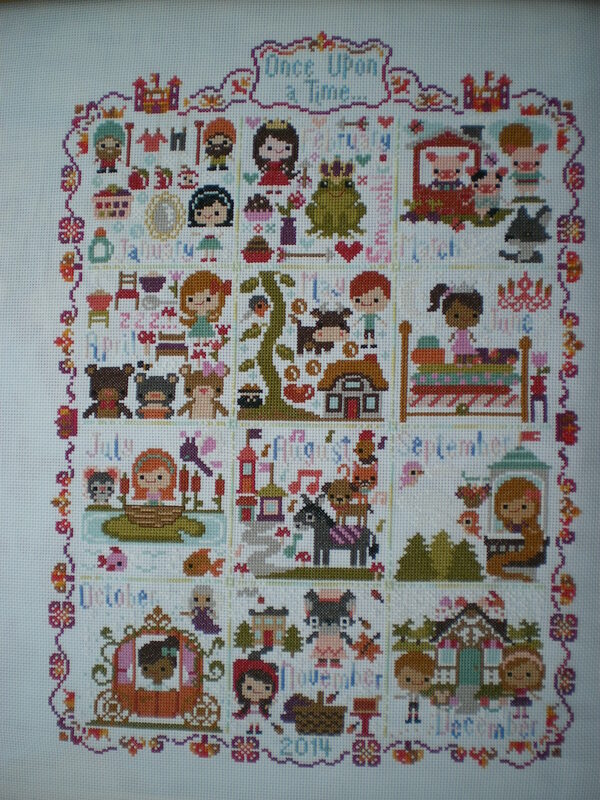 I did manage to finish the OUAT square last weekend, and even did a bit more on the border. 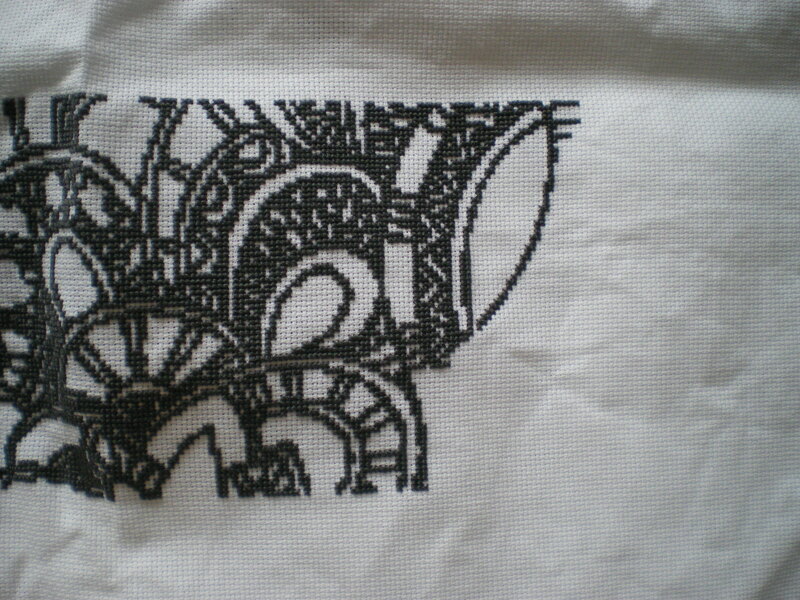 Looking at the picture, I’ve nearly reached the side of the piece, so I’m hoping to finish stitching it this weekend, as next weekend I’ve got a friend coming so I won’t get much done on this (but my first Cardiff sock might get finished). 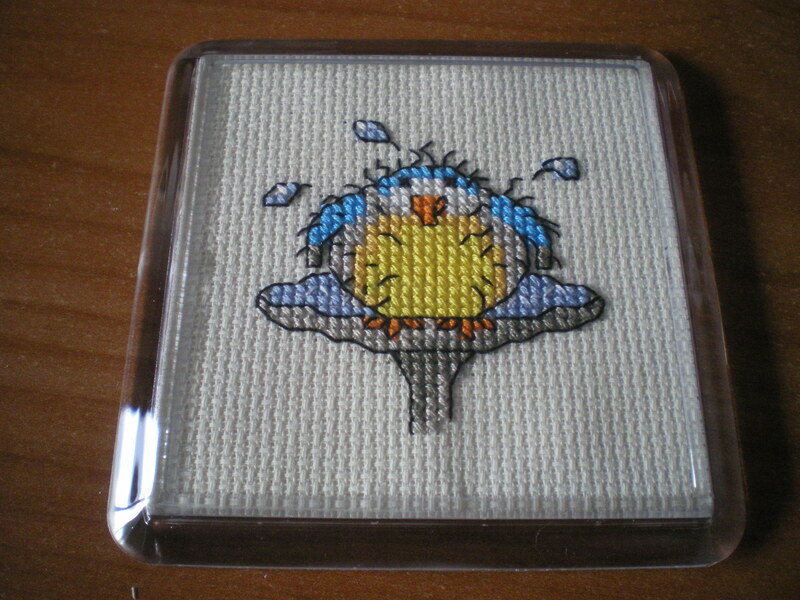 So, going back to the Christmas presents: I now have to stitch a set of cards for a friend, and cross stitch some birds for a set of coasters for my aunt, who enjoys bird-watching. 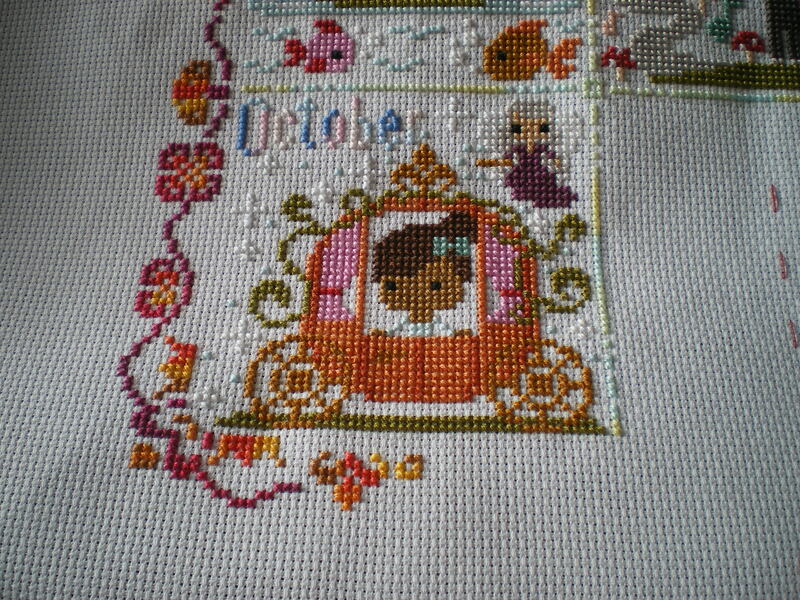 I’m estimating that each of these will take a month to complete, so that’s October and November dealt with, and then I have December free, to do what I want 🙂 Provided, of course, that I finish the Christmas tree decoration next week! 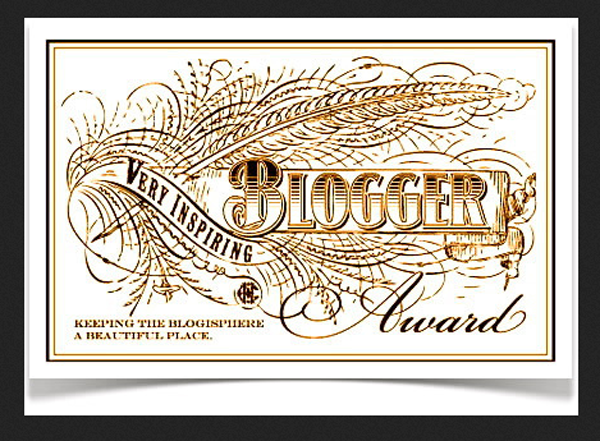 It feels very nice (but a bit strange!) 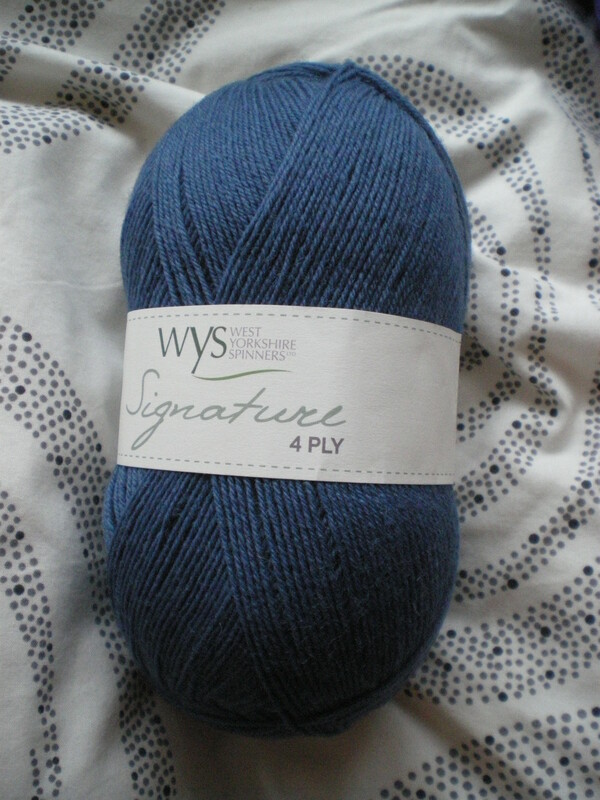 the idea that I’ll have finished Christmas presents *early*! Very unusual state of affairs!